Read more about the ranking here. RSVP: Free to attend, registration required to secure a spot (limited space available). Register here, email info@cusbdc.org, or call 217-378-8535. Lunch and all materials will be provided. *This is designed for users who have less than six months of experience working with QuickBooks Desktop Version. Accounting basics will also be covered to serve as a foundation to operate the software correctly. The Interview Skills Workshop will focus on learning helpful tips on how to better prepare for an interview, how to answer some of the difficult interview questions, and how to make a positive impression at the interview. This workshop is offered on March 4, April 3, and May 6, 2019 from 10:00 am-11:00 am. The Resume Building Workshop will focus on understanding the purpose and features of a resume and learning how to avoid common writing mistakes and errors. This workshop is offered on March 14, April 11, and May 9, 2019 from 9:00 am – 10:00 am. The Job Search Techniques Workshop will show the job seeker how to prepare and organize their job search, get a better understanding of job networking, and the benefits of networking and exploring online job sites. This workshop is offered on March 18, April 15, and May 13, 2019 from 10:00 am – 11:00 am. The Basic Math Workshop will concentrate on how to solve basic math problems that that include fractions. This workshop is geared to help the job seeker to be better prepared to handle the employer based math assessment tests that are a step in the employers’ employment process. This workshop is offered on April 8, April 22, May 6, and May 20 from 1:00 pm – 2:00 pm. Turn to the Decatur Illinois workNet Center for assistance to connect to local partners, employers, explore job opportunities, and access to training programs for career pathways to employment. The Illinois workNet Center, partnering with Workforce Investment Solutions, is hosting a Hiring Event for Ring Container on Thursday, March 14, 2019 from 10:00 a.m. to 2:00 p.m.. Potential applicants can come to Workforce Investment Solutions, located at 757 W. Pershing Road, Decatur, Illinois, and interview directly with Ring Container hiring staff. Ring Container is looking to fill Warehouse and Machine Operator positions. Anyone interested should bring a copy of their resume and be dressed appropriately for an interview. Another hiring event between the Illinois workNet Center and Workforce Investment Solutions is with the U.S. Census Bureau on Thursday, March 21, 2019 from 10:00 a.m. to 2:00 p.m. The U.S. Census Bureau is looking to fill many positions for their upcoming 2020 census and anyone interested should come to Workforce Investment Solutions, located at 757 W. Pershing Road, Decatur, Illinois to speak with the U.S.Census Bureau Representative. All potential applicants should come with a resume and dress appropriately for an interview. ATLANTA – The U.S. Small Business Administration (SBA) encourages businesses of all sizes, private nonprofit organizations, homeowners and renters to apply for a disaster loan before the Feb. 19 deadline. Anyone in the declared counties in Illinois with damages caused by the severe storms and tornadoes on Dec. 1, 2018 should apply for the SBA disaster loan assistance. The declaration covers Christian, Macon, Montgomery, Sangamon and Shelby in Illinois. Interest rates are as low as 3.74 percent for businesses, 2.75 percent for private nonprofit organizations, and 2.00 percent for homeowners and renters, with terms up to 30 years. The SBA determines loan amounts and terms based on each applicant’s circumstances. Additional details on the loan application process can be obtained by calling the SBA Customer Service Center at 800-659-2955 (800-877-8339 for the deaf and hard-of-hearing) or by sending an email to disastercustomerservice@sba.gov. Loan applications can also be downloaded at www.sba.gov. Completed applications should be returned to a recovery center or mailed to: U.S. Small Business Administration, Processing and Disbursement Center, 14925 Kingsport Road, Fort Worth, TX 76155. The filing deadline to submit applications for physical property damage is Feb. 19, 2019. The deadline for economic injury applications is Sept. 23, 2019. Join the Illinois Small Business Development Center (SBDC) on January 23rd for a FREE workshop on International E-commerce. RSVP: Free to attend, registration required to secure a spot (limited space available). Register here, email info@cusbdc.org, or call 217-378-8535. All materials will be provided. 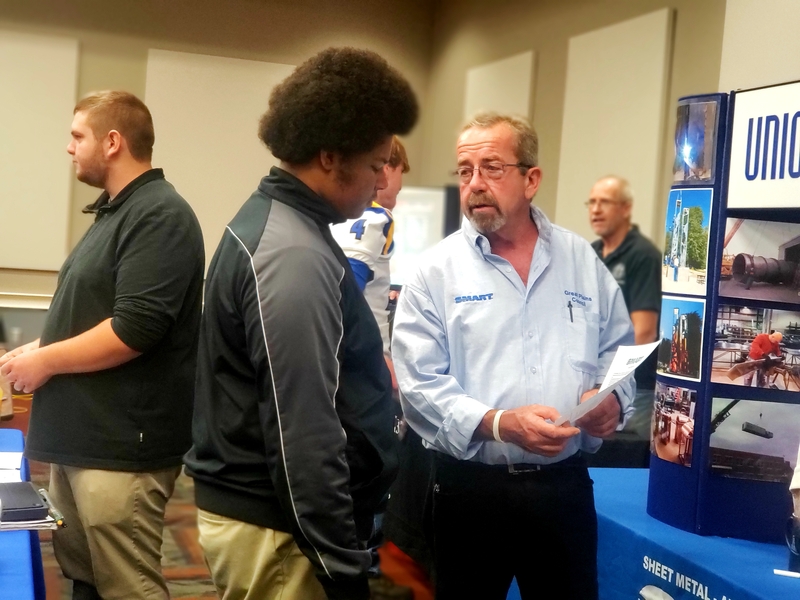 Approximately 225 students from Decatur’s MacArthur and Eisenhower High Schools and Heartland Tech Academy participated in Decatur’s Third Annual Manufacturing Days held on October 18th and 19th at Richland Community College in Decatur, IL. The two-day event encouraged students to get a closer look at available manufacturing career paths through facility tours and talking with local manufacturers. Studies show that the U.S. will need to fill 3.5 million advanced manufacturing jobs over the next 10 years. Events like Decatur’s Manufacturing Days are coordinated in hopes that the next generation of manufacturers will become inspired for careers in manufacturing. Manufacturing Days would not be a success without the help from the participating manufacturers (see list below), Richland Community College, DPS61, and the Heartland Tech Academy. To schedule an appointment with Don, please email don@cusbdc.org with your preferred date and time during these sessions. “Decatur’s global presence grows with the addition of Tentamus to the community. Their industry experience, resources and connections will bring great value to the Decatur economy,” said Ryan McCrady, president of the Economic Development Corporation of Decatur – Macon County. Home to a $9 billion crop business, bio-seed products market, and a leading producer of corn and soy, Illinois has become a juggernaut in the bioscience and technology industry. With a rich heritage of agriculture and food sciences, Decatur and Macon County is a major contributor to this industry in the state. Tentamus Group was founded a decade ago. Tentamus is a global product and safety group with a core presence in Europe, UK, Israel, Greater China, Japan and the USA. Accredited and licensed Tentamus Group tests, audits and consults on all products involving the human body. Tentamus Group is represented in over 50 locations worldwide. More than 2,500 highly-trained staff members work in over 1.5 million square feet of laboratory and office spaces. Classification is one of the hardest parts of importing and exporting, and you may have some questions like: How do you know that the classifications used by your customs broker or freight forwarder are up-to-date? Do you know if you have any binding rulings with CBP? Do you know if there are similar products with binding rulings that you can review? All of these questions and more will be answered during an upcoming workshop with the Illinois Small Business Development Center and presented by Mike Allocca of Allocca Enterprises. Cost: $150/person if you register before August 31st; $195/person starting September 1st. RSVP: Registration and payment required to secure a spot – limited space available. Registration fee includes conference fees, materials, breakfast and lunch. RSVP online here or to Carly at carly@champaigncountyedc.org. This workshop is eligible for 6 NASBITE-CGBP Re-Certification CEUs.